It’s arguably one of the more unique and compelling of Hollywood’s shared cinematic universe – largely because it adheres to its own ruleset, coupled with that signature sense of secrecy – and later this year, Paramount and Bad Robot’s Cloververse will make room for its third installment in the form of God Particle. What’s particularly fascinating about Julius Onah’s sci-fi thriller is that it didn’t actually begin life as Cloverfield 3, and was instead absorbed into Paramount’s peculiar monster universe after years spent collecting dust on the shelf. Now, it’s officially set sights on a late-October release date, and has tapped an all-star ensemble for the ride: David Oyelowo, Gugu Mbatha-Raw, Daniel Brühl, Chris O’Dowd, Ziyi Zhang, and Guardians of the Galaxy Vol. 2 star Elizabeth Debicki. Barring the inclusion of some mass particle accelerator, there are precious few story details out in the open regarding Onah’s sci-fi anthology film, but it appears that one Reddit user by the name of Dratliff21 (h/t Bloody Disgusting) has uncovered the motherload: a detailed overview of God Particle‘s narrative, which reveals strong ties to Dan Trachtenberg’s 10 Cloverfield Lane. It is, unsurprisingly, riddled with potential spoilers, so continue on at your own discretion. Still with us? Any plot point that surfaces via Reddit tends to leave us feeling rather wary, and should always be picked apart with a fine-tooth comb before it’s taken as gospel. Keep that in mind while reading through the alleged synopsis below, as a handful of grammatical errors leads us to believe that the post has simply taken the bare bones of God Particle‘s plot and filled in the blanks. This science-fiction horror thriller is the third film in the Cloverfield monster universe. As a calamitous world war between the United States and the European Union rages, spurred on by an invasion of alien creatures that threatens all of mankind, a group of American astronauts is sent out to space aboard the space station ‘Dandelion’ with a very specific mission: to test out a new Higgs Boson “God Particle” accelerator that just might be the key to humanity’s survival. But when the crew, under direction from their captain Ava Hamilton, turns on the device, the Earth seemingly disappears. Realizing their coordinates haven’t changed, the entire crew – including fellow engineer and Ava’s boyfriend, Evan, the boyish Mika, the pious Monk, shaggy-haired ship screw-up Mundy, and military agents Martinez and Cosbi – now fear that they are truly lost in space and have to prepare to wait out the remainder of their lives [in] this self-sustaining space station. Unexpectedly, they are soon contacted by an enemy European spaceship – giving them hope and concern at the same time. After [much] debate, they agree [to] let the new crew onto their ship, a decision that almost immediately turns tragic when Ava’s boyfriend Evan is poisoned. As accusations fly amidst increased tensions, the American crew decides to imprison the European astronauts. But when Mundy soon turns up dead, Ava must now figure out who the murderers really are…and who anyone can trust as the American crew must battle against each other, as well as with the new intruders, who are soon intent on getting the superweapon on board the ship for their own purposes back on Earth. 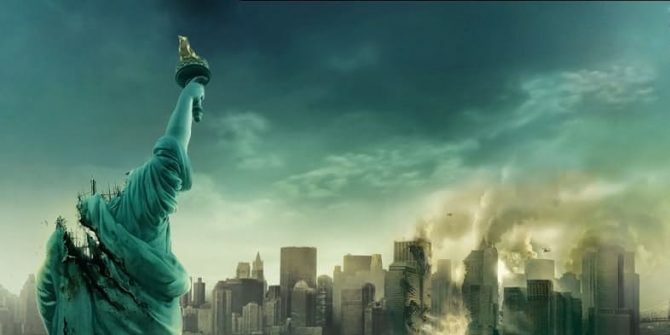 All will hopefully be revealed when God Particle (AKA Cloverfield 3) roars to life on October 27th.